A novice search engine user may find searching the Web for information difficult and frustrating because she may naturally express search goals rather than the topic keywords search engines need. 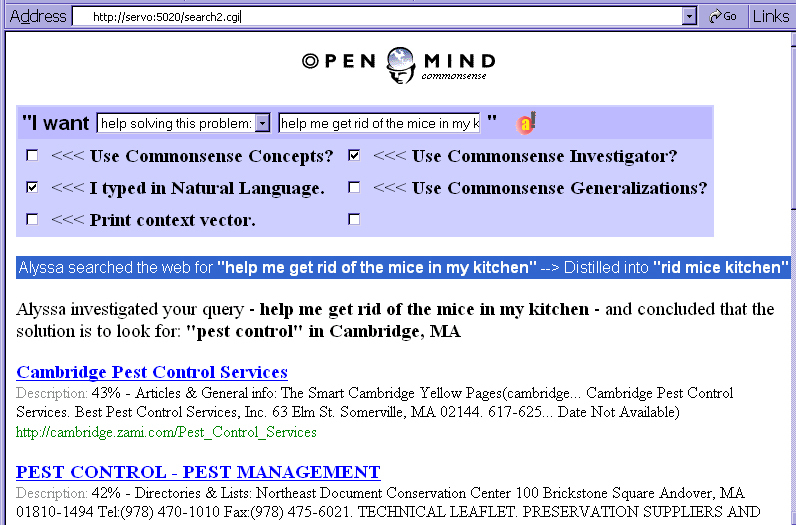 GOOSE (goal-oriented search engine interface) is an adaptive search engine interface that uses natural language processing to parse a user’s search goal, and uses "common sense" reasoning to interpret this goal, and reason from it an effective query. For example, if a user tells the search engine: "I want to find other people who like old movies," GOOSE would reason that old movies is a hobby that someone might have, and that people talk about their hobbies on their webpage. GOOSE would construct a query which targets the retrieval of someone's web page, as follows: +"my homepage" +"interests" +"old movies". While we cannot be assured of the robustness of the commonsense inference, in a substantial number of cases, GOOSE is more likely to satisfy the user's original search goals than simple keywords or conventional query.